Planting time - onion sets are in, as are the strawberries (in hanging baskets). Lettuce seed (and some plants from the store) are in. Garlic from last fall is 8-10 inches tall. Dill and other herbs going into earthboxes. A few years ago I built a community garden for my mom's condo complex consisting of several above ground planter boxes to be used by the tenants if they choose. I built myself my own little area wherein I grow corn, tomatoes and strawberries. I'm also involved in another project that, once it catches on, should help to increase my bill fold. Sorry for the shameless plug but advertising these things is part of my job. Will look closer at this when given time. My garden is covered in a shitload of snow. Mrs. Woland co-owns a nice summer house (together with her father). Her father is an old man who more or less gave up on his garden years ago, and she is a bizzie who couldn't find time for gardening in her schedule. Me; I'm stuck at the computer 10-14 hours a day. The garden called, I answered. Hauling stone, moving soil, planting, tending, relaxing. Gardening has really turned out to be something that tires my body and is therapautical for my mind. Mainly grow things for estetical pleasure, but we do fruits and berries as well. The missus makes a hell of a Gin & Home-made Gooseberryjuice long-drink. and I will start pre-cultivating my bulbs. I haven't planted anything since I was a little kid. I used to help my grandfather in his garden by working a tiller. That was always fun. I'd till the ground and then he would plant tomatoes and corn. Hell, I might even just give it a shot this summer, seeing as I'm always in the house now. Planting season is still a few months away here but I don't know if I'll be gardening this year yet, simply because we may be moving. I love planting a garden every year, as it gives me time to think while doing something I enjoy. Quiet time just tending to the plants and time in the daylight that I so crave makes a garden worth millions to me. I'll know for sure around the end of March whether or not I'll get to have a garden this year. If I do, it'll be tomatoes of all kinds, peppers of all kinds too, acorn squash, butternut squash, and of course jack-o-lanterns and ghost pumpkins. A few gourd plants may be tossed in the mix as my youngest wants to start making birdhouses out of them. It's just a matter of time waiting to see if there's a move in store for us though. I’m hoping if we do move we can get some place with a bit bigger back yard for a bigger garden. My other half might have issues with a bigger garden but I’ll get the help I need to get it put in, well, because fresh salsa always makes for a great bribing tool. I just remind everyone, and boom, the garden is tilled, prepared with a good mix, tilled one more time and ready for planting. These are good summertime drinks. I always end up killing everything, whether I start from seed or get my little plants from Home Depot. I've come to terms with this, as well as the fact that I do not enjoy playing around in the dirt on a scorching and/or humid Florida day. Thank jeebus I'm not alone. I've killed cacti through unintentional neglect. When people give me flowers I always laugh. Even fungi die horribly in my care. I wish it were different. I can provide care for animals and children, but inanimate life forms tend to die off. I get it; there's direct sunlight, sufficient water and nutrients and a narrow temperature range involved. Still. I've played classical. I've played metal. I've talked to the wee bastards. I've supplied them with a healthy environment. Plants don't like me. That's ok Nemesis and SkaffenAmtiskaw, I can't keep an orchid alive to save my life. I've managed to kill every single one I've ever gotten or bought. The best I can figure is it has something to do with our water because of the calcium and fluoride that's in it. It makes me crazy because I know people that can grow them and get them to bloom without a problem, but of course they're not in this town. I also lost my favorite 5 foot braided tropical Hibiscus tree this year. This home is heated with gas heat and it really, really didn't like it. All my other houseplants are growing like mad, but that one didn't survive because there's almost no moisture in the air now that the furnace has been on longer than a night or two. No amount of water was enough because the leaves would dry out too fast once they started to grow. They never got the chance to toughen and thicken like they should have. I was bummed to have lost that one. I informed my other half that I want to move far enough south that I can put orchids in the trees and tropical hibiscus outside. The orchids grow very well in joints where the branches start at the trunk. 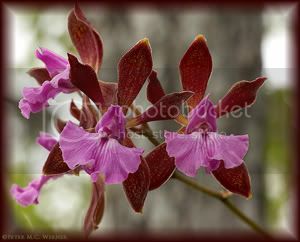 Arizona, Florida, New Mexico, Southern California, even Georgia and Alabama are great states to grow Orchids in the trees, or in baskets hung under the tree canopy. Water once a month during the dry season and they should do great. I don't think we'll be moving quite that far south if we do move though. We all seem to want to go where I should be able to have orchids outside most of the year. I'm just not sure because from friends of ours that moved there, it's HEAVY bible country. I've got enough of that here! **I know this is completely off topic, but that avatar is completely creepy Nemesis. I've seen a similar pic a while back and it gave me the same icky feeling. Now this is one thing that actually made me like this place without one shred of doubt for a few moments I actually forgot I hate so much. A planting discussion that is not about pot! I have Banzai Tree. Orchids have a period of hibernation between bloomings. You migt want to try a weekly 30 minutes soaking of the whole root system, combined with patience. Read up on the net, the control of temperature and exposition to sunlight is essential. Shaping, growing & nurturing is a basic need in man. Thank jeebus I'm not alone. I've killed cacti through unintentional neglect. I threw away a cactus last week after I found out the poor thing died long long ago and all that was left crumbled on touch. Making a cactus die due lack of water is a clear indication you don't have "green" fingers. I remember having a pet mouse that jumped and bit my hand when I opened its cage, making me wonder how long ago it was I last fed it. I stick to growing beards nowadays. I hate to say it, but I've tried that method Woland. I truly enjoy orchids simply because there's not any other plant that looks quite like them. I found one I'd love to get. It smells like chocolate and the blooms are amazing looking, but I dare not, at least not here in this house. Maybe when and if we move I'll try again. Until then, I know better. The chocolate orchid that I've seen, but there are others out there that look similar and smell just as good. **Crossing my fingers this works! Generated in 0.032 seconds of which 0.002 seconds were spent on 27 queries. Zlib compression disabled.